You are not a dummy. But climate deniers treat you that way. That’s because they know that easy answers, the simpleton’s way of dealing with things, is so easy to digest and internalize that even you, and other smart people like you, are likely to digest and internalize it. You too can have that wonderful “Aha!” moment when everything seems to make perfect sense — especially if the simpleton’s way is disguised as sophisticated and scientific, and/or condensed to a 5-second sound bite. You will happily tweet about it and link to it on your facebook page. Before long, the simpleton’s way goes viral. That’s not because you’re a dummy; you aren’t. It’s because the desire to understand is so strong, that when offered a cheap and easy chicken-McNugget answer with some honey mustard sauce, people will swallow it. I guess he still hasn’t gotten over an old post of mine showing how misleading his “snow job” about snow was. 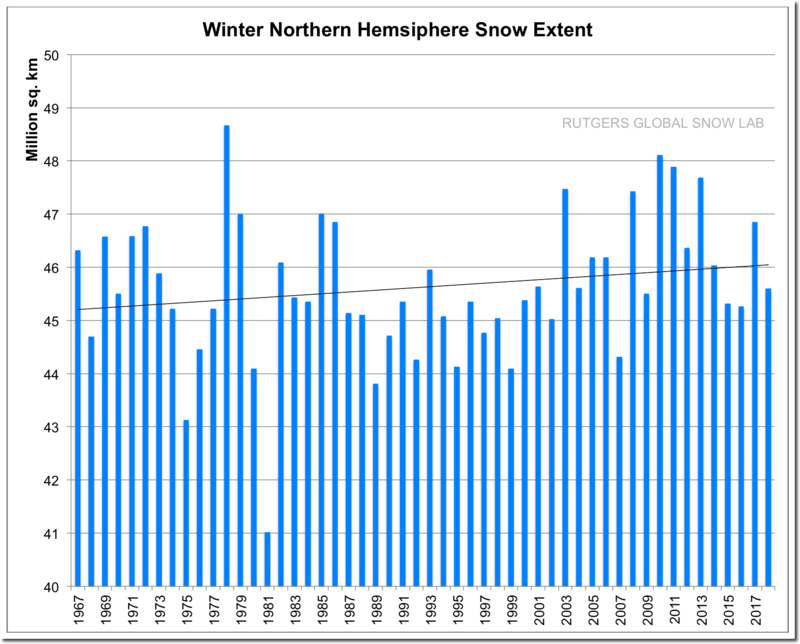 The simpleton’s way: global warming must mean less snow, but wintertime snow has been increasing so — no global warming! It’s as easy as that. The problem with the idea is that reality is not so simple. First problem: that increase isn’t “fer sure.” We don’t just look at a graph, or fit a linear trend and check whether it’s going up or down, because we could get fooled by a false appearance due to random fluctuations. After all, if you roll the dice twice, and the first time you roll a 5 but the second time you roll a 6, you wouldn’t declare the dice are trending up. You’d accept the fact that dice rolls have randomness, so you shouldn’t be surprised at all if one roll is higher than another. Besides the solid red line showing the estimated linear trend, there are also dashed red lines showing the uncertainty in that estimate. Suddenly it’s not so clear, just from looking, that the trend is really going up. We can even apply a statistical test, which says: no, there’s really no reliable evidence that the trend is going anywhere. But that takes some analysis. It involves math. It requires some thought, and even a bit of knowledge. I don’t blame people for not having that knowledge — few people have studied statistics and even those who have sometimes make mistakes. I don’t even blame people for getting suckered by Tony Heller’s graph. 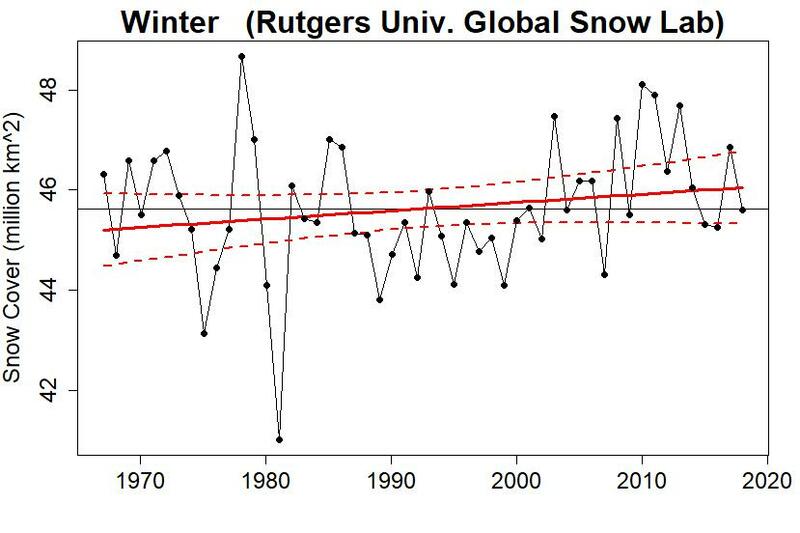 It looks so scientific, it’s labelled “Rutgers Global Snow Lab,” it even has a trend line in it! Second problem: as I pointed out in my post, a warmer atmosphere can hold more water vapor; that’s basic thermodynamics (the “Clausius-Clapeyron equation”). More water vapor means it can rain more rain, or snow more snow. During autumn and winter, the seasons when snow builds up, heavier snows — not in spite of global warming but because of it — can lead to more extensive snow cover. During the snow melt seasons, spring and summer, higher temperatures mean the snow melts faster and sooner, so we expect less snow cover. And what do we observe? During winter the trend estimate is up, but as mentioned it’s not “statistically significant” so we can’t be sure. During autumn the trend is upward and it is statistically significant. That’s what we expect from global warming — unless you take the simpleton’s view that warming has to mean less snow, regardless of the laws of physics. 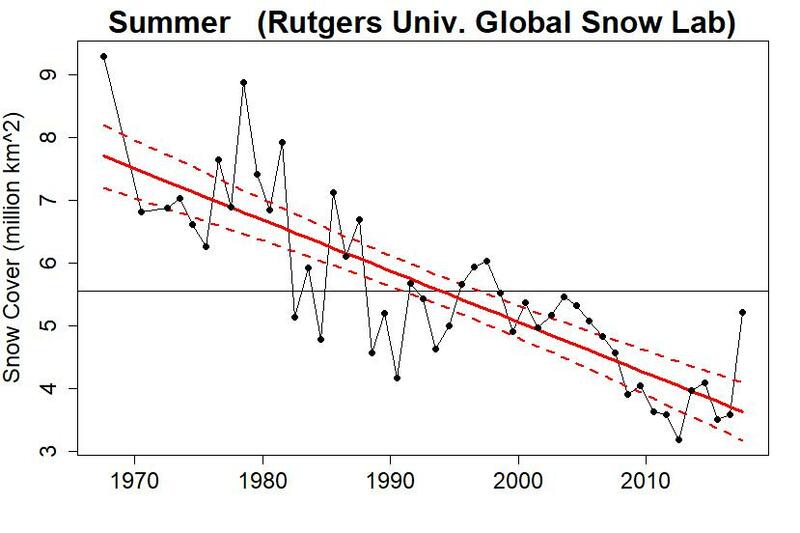 During spring and summer the trend in snow cover is down, and is statistically significant during both seasons. It’s even a large trend, going down faster than winter or autumn is going up. That too is what we expect from global warming, but you have to go beyond the simpleton’s view to see it. The truth takes time, work, and knowledge. Who even bothers to wonder whether the trend line in Tony Heller’s graph is statistically significant so it means anything at all? How many readers know about the Clausius-Clapeyron equation and the greater water vapor content in the atmosphere because of global warming? How many dive even deeper, to figure out that we could expect heavier snowfalls during autumn and winter but faster snowmelt during spring and summer? Not many. And how many people will tweet about that? How many will post multiple graphs showing seasonal differences in snow cover on their facebook page? Not many. Another factor (that also seems counter-intuitive) is that it can’t snow if it’s too cold! So while some areas that were cold enough to snow in the past may, on average, get too warm to snow, other very cold areas could warm up enough to allow snow. Its impossible to find any statistical significance in anything by Heller because its always cherrypicked. 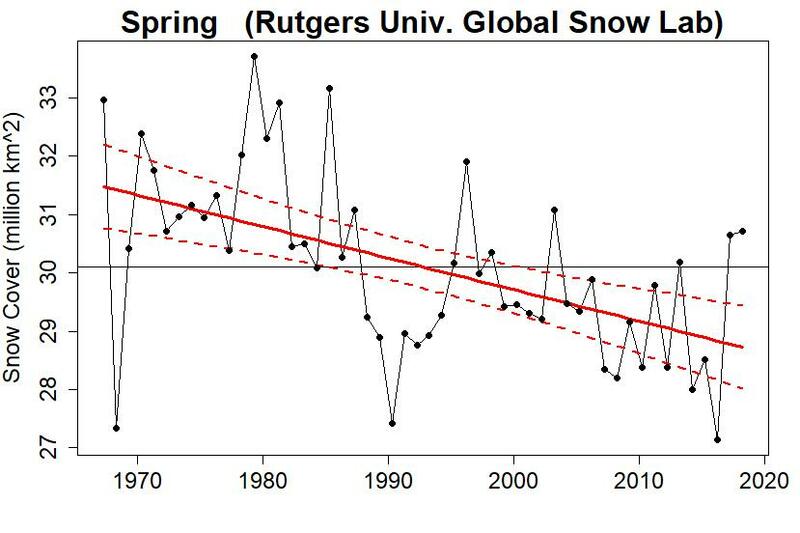 I don’t consider the decline (or otherwise) of the Northern Hemisphere snow cover since the 1970s (when the Rutgers Snow Lab data provides a full record) is fully captured by seasonal regressions. If the weekly data is plotted out as an anomaly and decadally to iron out the annual variation, (as per here (usually two clicks to ‘download your attachment’) the extent of the changing snow cover is better revealed – rising snow cover during Nov-Jan and a massive reduction during May-June. The May-June reduction has abated through the last two years (as can be made out on this cat’s cradle graph of the annual snow cover anomalies -two clicks to download) so the feature of an increasingly un-snowy May-June could look a little less dramatic by the decade’s end, although there was high drama early in the decade, back in 2011-12 when the weekly anomalies were smashing the un-snowy records by a million-plus sq km – that it was a bit eye-popping. I think the story behind wintertime snow cover is probably more complex than “warmer atmosphere means heavier snow”. That could affect extent if regions that previously melted out in winter now get covered, but I’d speculate there’s a big internal variability component. I know big blocking events during winter, of which we’ve had many recently, were responsible for covering the UK in December 2010 and March 2018. CMIP5 models have Clausius-Clapeyron, but they tend to show big decreases in winter, so there’s something missing. IMO the obvious candidates are a wild trend in natural variability or changes in e.g. blocking. The more you know the more you know you dont know. The Relativity of Wrong and Dunning–Kruger both come in to play when we examine the denial echo chambers and their nonsense. We often see widening discussion on this blog, like MikeR does just above. posing new questions. 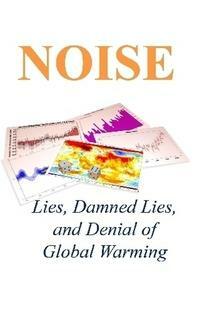 The science of climate change is far more complex than simple answers would suggest. Such discourse often makes the citizens of this blog learn ,think and keeps many of us coming back for more. It also reminds us how little we know even when acknowledged experts drop by here to add their input. The uncertainty is the most concerning aspect of the present climate change. What monsters lurk unknown when we push the climatic system past anything we can clearly deduce from history. I agree with what you say but I’d suggest that its not the entire picture. There are plenty of articles and other sites (certainly not this site) that put forward shallow arguments. I’m sure we’ve all read an article that basically boiled down to “97% of scientists say it is so”. My experience is that it is hard to get to the bottom of the climate debate precisely because there are so many facile arguments and so few deeper sites like your own. Me: are land temperatures rising? Pro: yes, here are the charts. Me: Ok, that’s pretty clear. Anti: Yes, but those are adjusted. The adjustments themselves are in question. Me: ok, but what are the actual reasons? Anti: Yes, TOB could be but its only maximum 0.3C but trend in adjustments shows about 0.6C so it can only explain at most half. Yes, its complex. So far I don’t see a clear winner. For all of the investment in reading and asking and thinking, and for all of the investment of time from those kind folks who have responded to questions, I’m sorry to say that I’m not really convinced one way or the other – and I hate to be wishy-washy! I’d much rather come down on one side or the other. 2. Someone who invests time to really investigate may not be any more certain in the end than someone who simply adopts a position (for or against) based on some simplistic argument that takes their fancy. That’s sad! 3. Please keep it up. My next topics to investigate on your site are ice extent and sea levels. This site enables people to read more deeply and reach an understanding on their own. [Response: Thank you for a thoughtful comment. I’m especially pleased that you focus on the topic of this post, which is not snow extent, it’s facile arguments. 1) They are utterly inconsistent in their arguments–willing to engage in contradictory arguments with the sole purpose of sowing doubt in the minds of those who do not understand the science. 2) They simply refuse to admit that science works–that, for example, the adjustments to observations are made for good, scientific reasons, have been reviewed extensively by other climate scientists, scientific panels (NAS, APS, AMS, ACS, AGU…) and that even if you work with raw data, provided your analysis is reasonable, you still get warming. 3) They insist on cherrypicking examples that seem to support their point, when in reality, they are irrelevant to the science. 4) They fricking lie through their teeth! There is no other area of science where people require that the explanations, theories and results must be understandable to the dumbest moron on the planet before they are valid. I don’t see people claiming a vast conspiracy to fabricate a Bose-Einstein Condensate or that black holes are a Chinese hoax. I certainly applaud the efforts amateurs make to understand the science, but as an amateur, you have to understand that there will be things the experts understand that you do not. That isn’t evidence of a conspiracy. It’s the nature of expertise. Well Rep. Broun (R) has successfully campaigned on the idea that the Big Bang and evolution are “Lies straight from the Pit of Hell”. it would seem to me that black holes would therefore be straight from Satan’s pit too. I suppose lies from the Pit of Hell would logically constitute a conspiracy vaster than anything limited to merely this Earthly plane of existence. But does all that mean that Broun gets all the POH email memos somehow? If so, I’m impressed; he should be working for NIS. Excellent post, and just made another small donation to your work.